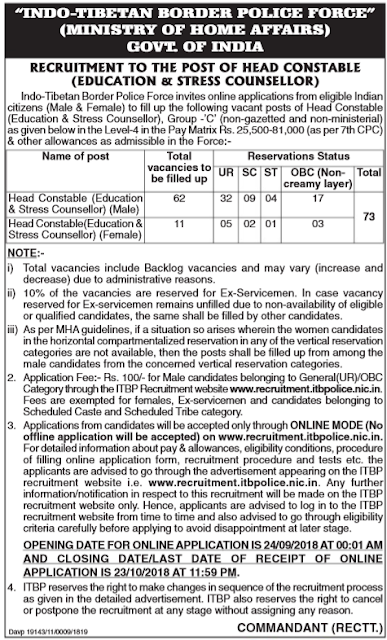 Indo-Tibetan Border Police Force invites online applications from all interested and eligible Indian citizens (Male & Female) to fill up the following vacant posts of Head Constable (Education & Stress Counsellor), Group -’C’ (non-gazetted and non-ministerial) as given below in the Level-4 in the Pay Matrix Rs. 25,500-81,000 (as per 7th CPC) & other allowances as admissible in the Force. More information related to this ITBP Recruitment 2018 for Head Constable posts is given below in this post. iii) As per MHA guidelines, if a situation so arises wherein the women candidates in the horizontal compartmentalized reservation in any of the vertical reservation categories are not available, then the posts shall be filled up from among the male candidates from the concerned vertical reservation categories. Rs. 100/- for Male candidates belonging to General(UR)/OBC Category through the ITBP Recruitment website www.recruitment.itbpolice.nic.in. Fees are exempted for females, Ex-servicemen and candidates belonging to Scheduled Caste and Scheduled Tribe category. Applications from candidates will be accepted only through ONLINE MODE (No offline application will be accepted) on www.recruitment.itbpolice.nic.in. The applicants are advised to go through the advertisement appearing on the ITBP recruitment website i.e. www.recruitment.itbpolice.nic.in. Any further information/notification in respect to this recruitment will be made on the ITBP recruitment website only. Hence, applicants are advised to log in to the ITBP recruitment website from time to time and also advised to go through eligibility criteria carefully before applying to avoid disappointment at later stage. OPENING DATE FOR ONLINE APPLICATION IS 24th Sept. 2018. CLOSING DATE FOR APPLYING IS 23rd Oct. 2018. 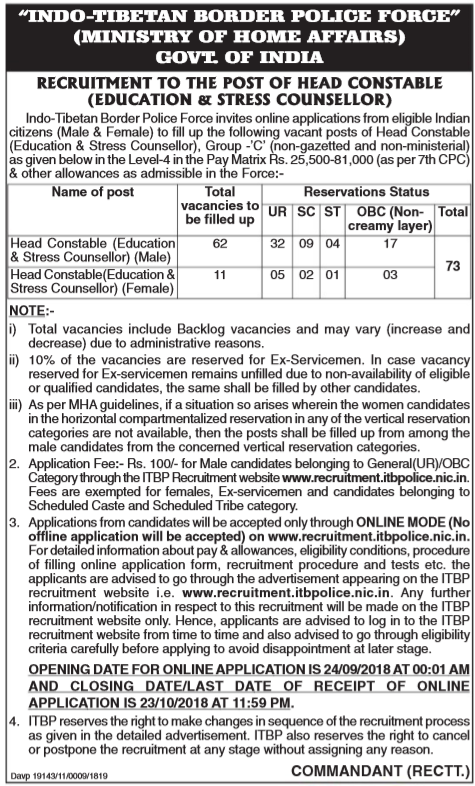 ITBP reserves the right to make changes in sequence of the recruitment process as given in the detailed advertisement. ITBP also reserves the right to cancel or postpone the recruitment at any stage without assigning any reason.